MOOD BOARD n. an arrangement of images, materials, pieces of text, etc., intended to evoke or project a particular style or concept. Using a mood board to help decorate a room can really set the stage for a successful space. If you aren’t familiar with a mood board, people use them to collect pictures of things they want to acquire, places they want to visit, to evoke a particular mood with text or images and place them in a collage format on a paper or even a virtual paper. You may have seen fashion boards that lay out an entire outfit that someone loves or wishes to wear in a collage from the earrings to the shoes – that would be a mood board. When using a mood board to decorate, the idea is to place pictures of furniture items that you like, art samples, decor items, fabric swatches and paint swatches on a piece of paper to plan a room. The first place you should start is with an item that you have and love or that inspires or evokes a feeling you want for the room. That would be your jumping off point. Either take a picture of it or copy the image and print it out. I am currently working on redoing my son’s room. The desk and bed frame we already own. These dictate how I will design his room. I could paint the desk white and give it a more modern feel, but that would not pair well with the vintage bed. If you are unsure about where to begin, start by scouring the internet and looking at different websites that have items that you love available for sale or by perusing Houzz.com. There you will find thousands of images that will have something that speaks to you in some way. Maybe a whole room will inspire you or maybe just one item would give you a sense of what you love. Copy that image, paste to a page and size it down. Even if you don’t plan on buying the item, you may love it and you can use something you already have and alter it to replicate a similar look, purchase a less expensive version of it or create it on your own from scratch. But at least you have an image in your head of the end result you desire. You can place several images on a page and then print them out all at once. Baskets, books, wall hooks, lamps, lampshades, etc. Print it off! Over time, which may be an afternoon or a week, you will have a small collection of things that inspire you. You will discover a lot of what you don’t love, too. If you have no idea of what your style is or what you like, doing this will help you discover that. As you start to print off pictures of things you love, you will start to get a sense of your style. You may love a lot of different things and that’s ok, too! There is no rule that says everything you own has to fall into one category. It is ok to have different styles meshed together and a mood board will help you be decisive on how to move forward and what goes together. The next step would be to pick an item out of your inspirational collection that evokes a feeling for the room you want and you will begin to create the ideal room off of that idea or piece. If it is an art piece, look closely at the colors in that piece and use those as inspiration for a palette. If it is a neutral piece, think of how you want to fill the room around it. Bring your printed picture of your inspired piece or pieces and head to your favorite paint section. Grab yourself some paint swatches. I am trying to use what we already have. I will paint his nightstand and dresser in a dark blue almost black and add a wood stained top. I will also add new hardware to update and blend the pieces to the room. The other swatches are the colors of the existing walls and trim. Not sure which ones you like? Grab a bunch!! You don’t need to decide at the store. You can bring these home and start to place them next to the picture you have printed and play around in the actual light of your home. Maybe you want to paint a piece of furniture and repurpose what you already have. That may be your starting point. Grab swatches for that, too! A piece of furniture can be completely transformed inexpensively and quickly with some paint and new hardware. The next thing to do would be to cut out all of your photos you have printed out. Grab a blank piece of paper or card stock and adhere your picture of your inspired piece. Simply place a piece of tape rolled up on the back so you can easily move the piece around the paper. Next, do the same thing with items that you want to have in that room. If you don’t like something as much as you thought, move on to another item and tape that one on your page. When you decide on the colors you want in that room, cut up your paint swatches and place those on the page, too. Without spending a dime so far, you are on your way to achieving the design of a beautiful room. Next up is Fabric! You can add small fabric swatches to your mood board, too. Simply go to the store and grab samples of fabrics that you love. This doesn’t cost you anything and will give you a sense of what you like. Play around with different textures and prints until something makes you happy! TIP:If you are using a sofa that you already have in a room you can usually find a swatch of fabric underneath the cushions attached by the tags. Go ahead and cut a little of that off! It’s ok! If you’re going with, say new bedding, and can’t get a swatch then just print off the picture from the website or off of your phone if you took a picture at the store. I did this for my son’s room. I had no actual bedding fabric sample so I just printed off the duvet and quilt I plan on purchasing from the website and put it all together on my board. If it didn’t work like I thought, I could just take it off the page. No returns! Take your fabric sample or your printed sample and place that on the mood board. Now you should have the all of the functional items, decor items, paint and fabric choices that you want to use in the space on your board. Think about the room’s function and the feeling you want to have when you walk into that room or what the person who may be living/working/playing in that room the most would want to feel when they are in the space. If it’s a playroom, add things that are exciting to children. That doesn’t mean that it can’t look nice. It can be aesthetically pleasing to the eye AND have great function. If it is a living room, chances are that kids aren’t going to be hanging out in there. How do you want to feel when you walk into the room? If you start there, it will help you eliminate things that don’t make you feel that way. I arranged everything around and love the flow of the colors in the room. I will add frames and artwork eventually but this is the inspiration. I still have to add paint swatch. This gives me a plan and all I have to do is execute! Another important factor is to talk about your design idea with the other people who will be using the space. 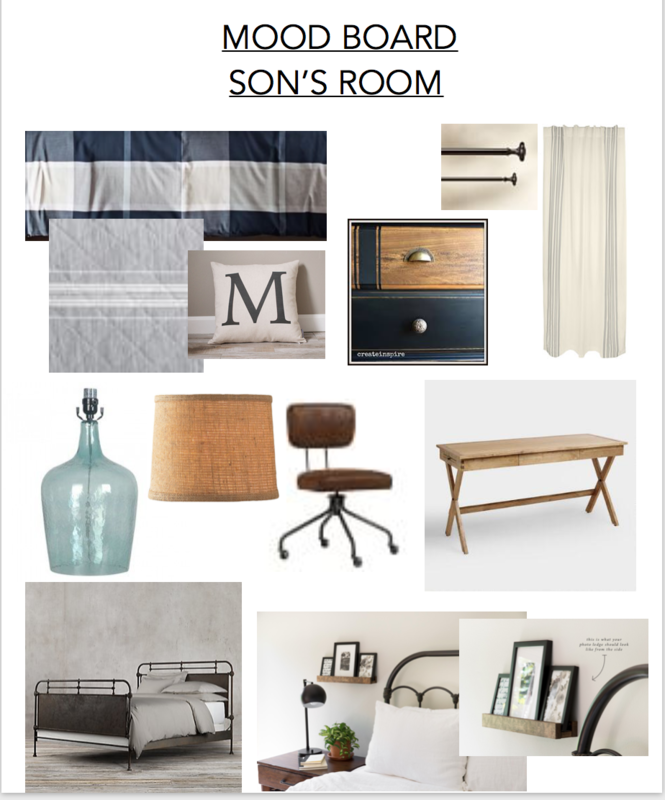 When putting together the mood board for my son’s room, he wanted it all modern. 1. that doesn’t flow within our home and 2. we had a bed frame and a desk that we already owned for that space and I wasn’t going to buy new items. I had a vision (like I had here for my entry way) that I thought would work for us both. So, we looked at the possibilities of items to use in the room together. By using a mood board, he was able to see the vision I had. He could have input on what he liked or didn’t like. Now we have a space that we will both love and that he will be happy to be in even before it is done. Because it was on a board, we could look at artwork, paint colors, bedding, etc. and change any of them out if he didn’t like the idea without any cost and minimal time! Make your own mood board and before you know it, you will have a room that you are excited about that YOU designed for YOUR taste. It may be a little overwhelming and you may think you have too many things that you like. But, by creating a mood board you can narrow all of the choices down and take out the fear! I would LOVE to see your mood boards and finished spaces! Please share! Tune in later to see how I took the ideas on paper and turned them into reality!